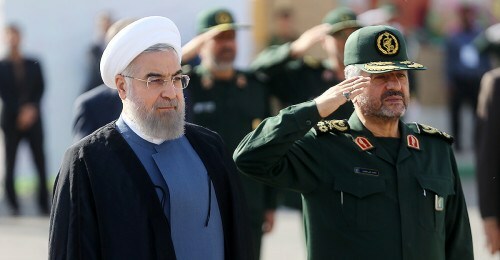 Iranian authorities Tuesday rejected US fresh sanctions against 18 individuals and entities over their involvement in the country’s ballistic missile program and pledged to slap on Americans their own sanctions. Eighteen people and entities were targeted by the new US sanctions against Iran over its missile program despite Washington’s acknowledgement for Iran’s compliance with requirements of the 2015 nuclear deal signed with world powers. The US treasury department said those sanctioned had backed Iran’s military or Iran’s Islamic Revolutionary Guard Corps (IRGC) by developing drones and military equipment, producing and maintaining boats, and procuring electronic components, Al Jazeera reports. Some of the targeted persons arranged the theft of US and Western software programs sold to Iran, the treasury department added in a statement. Two organisations of the Islamic Republic have been involved in the ballistic missile program. Washington also said it is concerned over activities in the Middle East, which undermine the stability of the region. The US is “deeply” concerned about “Iran’s malign activities across the Middle East which undermine regional stability, security, and prosperity,” including support for armed groups, the Syrian regime and Houthi rebels in Yemen, said Heather Nauert, US State Department spokeswoman. Iran did not wait long to condemn the new sanctions as its foreign ministry called them a “worthless” and “illegal” act, as reported by state-run news agency IRNA. “The Americans… want to weaken the capabilities and strength of the Islamic regime,” General Amir Ali Hajizadeh, who heads the Guard’s aerospace wing and missile program, was quoted by state TV as saying. “We propose reciprocal actions with a high cost,” he added. The Iranian parliament bypassed the fresh sanctions to increase the country’s missile program budget. It allotted additional $260m and announced similar sum for the military’s foreign operations wing, the Quds Forces. The Quds forces have been blacklisted by the US for fomenting unrest in the Middle East. Written by: Jaber Ali on July 19, 2017. Posted by Jaber Ali on Jul 19 2017. Filed under Headlines, World News. You can follow any responses to this entry through the RSS 2.0. Both comments and pings are currently closed.